DALI Lektor 6 review | What Hi-Fi? Cast your mind back to October 2008, and you'll remember that we looked at Dali's Award-winning Lektor 1s, the first of a range sitting beneath the Ikon series. Now it's the turn of the £750, floorstanding Lektor 6s. 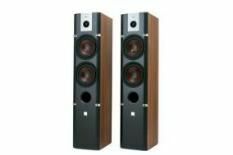 This price tag pits them against such stiff competition as the B&W 684s, which we gave five stars to. An initial look at the new arrivals suggests functionality, with a high quality vinyl wrap finish to boot (ours is walnut), and a solid appearance. In essence, they look like a stretched version of the smaller Lektor 1, right down to the attractive silver relief bearing the Dali logo above the soft-dome tweeter. Like the smaller versions they also use wood-fibre material cones in the mid/bass drivers. Dali says it prefers these as they combine rigidity and efficiency with a lighter mass than other materials. Put to the grindstone, the Lektor 6s produce a rich and colourful sound with plenty of sonic weight on offer. The treble here is crisp and direct, with no hint of stridency in its delivery. Underpinning the lower-end, the bass is full, although it lacks precision. Where the Lektors really make their mark though is in their fluid and supple mid-range, which handles vocals and instrumentation with insight and emotion. Carl Wilson's voice on The Beach Boys' God Only Knows is handled with a subtlety that really is a joy to listen to. Detailing is more than capable here, while these floorstanders are also no slouches when handling timing, such as on The Grateful Dead's stop/start Cream Puff War. Dali recommends positioning its speakers in a front-firing position, as opposed to inclining them towards the listener. When testing, we found this made the soundstage gain more depth. For our tests the speakers were positioned around 1m from the wall and well away from side-walls. The Lektor 6s are well worth taking time to listen to. The richness of the sound is compelling and smooth. It's only the vagueness of the bass the draws the line between good and great, and it's a pretty thin line at that.